If all that wasn’t enough, the Wheelers arrive! These guys are creepy as hell! They wore these frightening helmets with faces in them, spoke in a creepy, high-pitched voice, and proceed to chase Dorothy around the city. Looking back on it, I don’t know why I was so afraid of them… I mean they have wheels for hands and feet. What could they have really done if they had actually caught Dorothy? Well, I believe at the time, I thought maybe the Wheelers were the ones who turned everyone to stone, so I was afraid of them making contact with Dorothy! The only thing that should have been reassuring is that the Scarecrow returns in this movie for a little bit, but he looks very different. 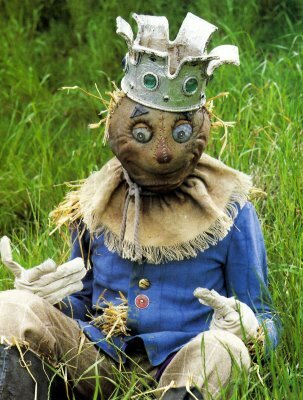 Whereas the in The Wizard of Oz, Scarecrow looks very human, he looks very different in Return to Oz. This time, the moviemakers make him look a little more like a large puppet. As a result, his unblinking eyes would just stare at everyone, making the overall affect quite unsettling, rather than reassuring. 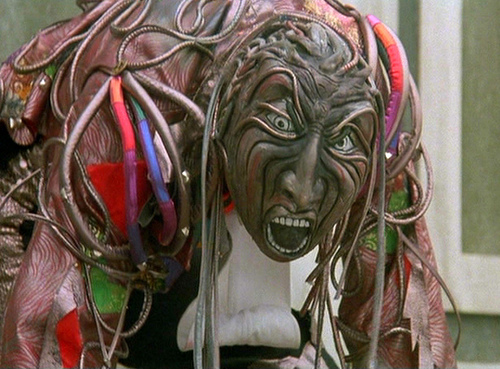 So, with the inclusion of an insane asylum (complete with shock therapy), a creepier Scarecrow, people turning to stone or knick-knacks, and the Wheelers, it is clear to see why I’ve included this movie on my list of Creepy Kids’ Movies. However, the creepiest, part of the movie I have yet to address. So… more to come! 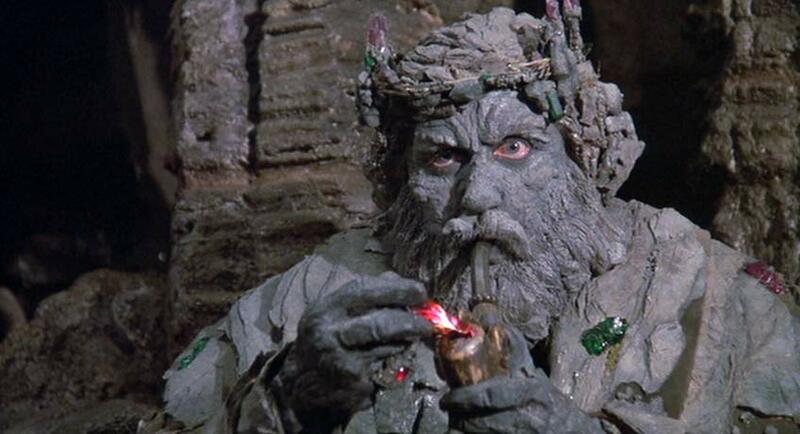 This entry was posted in Creepy Kids' Movies, Return to Oz and tagged Cowardly Lion, creepy kids' movie, Disney, Dorothy, Dorothy Gale, Emerald City, Nome King, Oz, Return to Oz, Scarecrow, Wheelers by timothyheinz. Bookmark the permalink.